No matter what challenges you are facing right now, you can improve your chance of success with a simple mental shift. And let’s face it – life is full of challenges – but are you making things harder than they need to be? Let’s say you are feeling compelled to do things that don’t agree with your plans. The world is not yielding to your will. So you fight, and argue, and think how unfair everything seems to be. But you continue doing what you think you are being forced to do. Isn’t the reality more along the lines of – you have agreed to do this thing you find so disagreeable? If so, then the truth lies closer to the idea that you are not happy with the choice you have made. But that fact is, you have made it. And rather than live with that choice, and try to make the best of it, you remain agitated. Keeping you removed from where, and who, you want to be. Wouldn’t it be easier to acknowledge that you have made a choice – to be in a certain job, or relationship – and then work from the mental framework that you are acting on your own will? Let’s say you have a job that doesn’t provide the benefits you want. Stop for a moment and accept that nobody forced you to take – or remain – at that job. So you are not being bent by the will of others. You have acted on your own will by accepting and keeping that job. In the first few moments, this shift helps you feel better. You are back in control. You are following your own will by staying in this job. You can then decide to make the best of it – to become perhaps, the best in your department. You can decide to add to your skillset while you are doing this task. You can will yourself to stay conscious of your decision to remain in this job and make the best of it. You can will yourself to be a pro. You can will yourself to make a plan to get into a more suitable position. You can will yourself to make the most of what you have. … that you can resolve to will, today, and with that resolve, work to improve the choices you have. And with that mental shift, begin to change where you are headed. To get started, today, please pay attention to the phrase, “I resolve to will.” Try it out for a few hours, or even days. Work with the idea that you can decide to control your will. That you have the ability to decide what you want and act on it, in any moment. 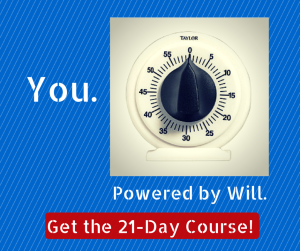 This phrase is the cornerstone of our 21-day course in the Power of Will. Using this idea, and building on it, day after day, helps you attain both clarity and control. By using the workbook that’s included in the course, PLUS listening to the 21 MP3s, PLUS reading the daily emails, you can achieve and maintain the state of mind where you are always aware that you are the one pulling your own strings. The ability to develop your own Power of Will is always within you. All you have to do is begin by thinking about your will. And when you think about your will, you can decide to do something with it. And by doing something according to your own will, you will get results. 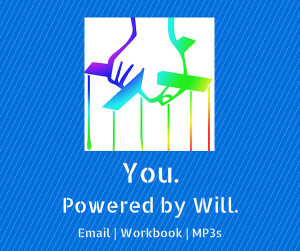 And when you get results from your will, you will feel more powerful. And every day after that, you will think about, and act on, your will. And very soon you will experience a self-sustaining momentum, based on your will, that will enable you to always be the one calling the shots. 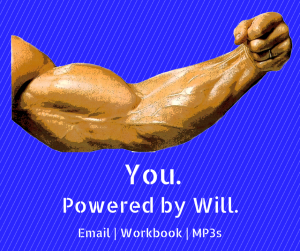 Even though we’ve just given you the key to developing your Power of Will, if you do want to access the material we have created, all you have to do is click here to access the workbook, 21 MP3s and daily email sequence, or you can use the convenient button below this message. All you have to do to develop your will is begin.